The Adventure By Sian from Natte Yallock Primary School. 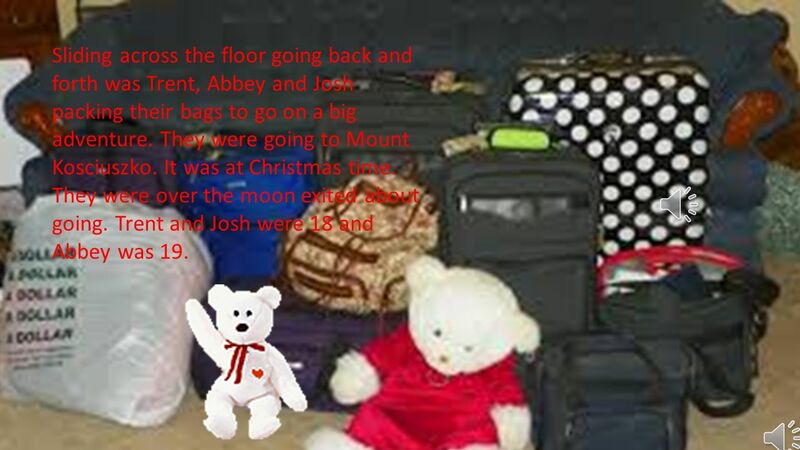 3 Sliding across the floor going back and forth was Trent, Abbey and Josh packing their bags to go on a big adventure. They were going to Mount Kosciuszko. It was at Christmas time. They were over the moon exited about going. Trent and Josh were 18 and Abbey was 19. 4 Trent, Josh and Abbey were saying bye to their parents and of course Abbey had to drive so the boys could sit in the back and talk. 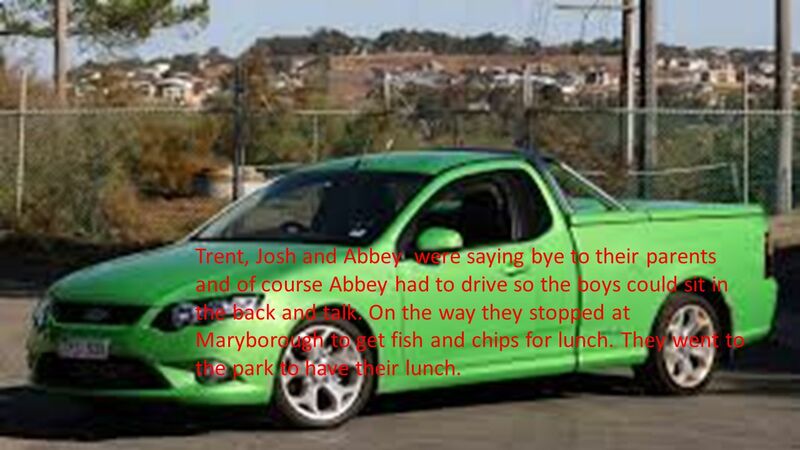 On the way they stopped at Maryborough to get fish and chips for lunch. They went to the park to have their lunch. 5 Off they went again. 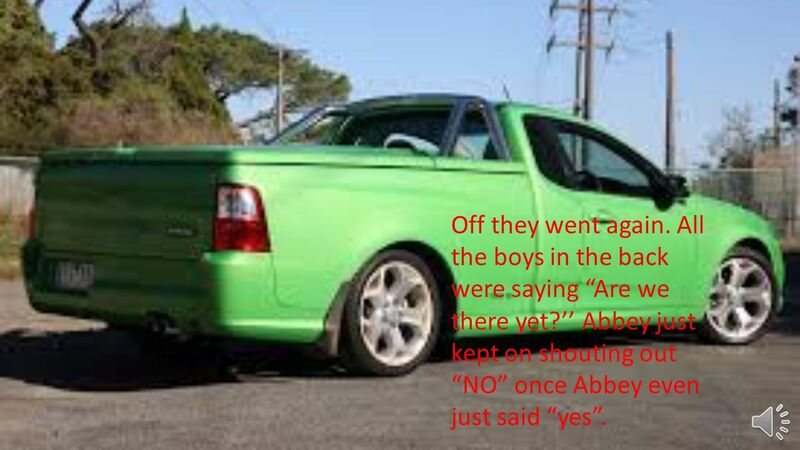 All the boys in the back were saying “Are we there yet?’’ Abbey just kept on shouting out “NO” once Abbey even just said “yes”. 6 When they got to their destination they unpacked their bags into the room. As soon as they finished that they went for a walk in the snow. 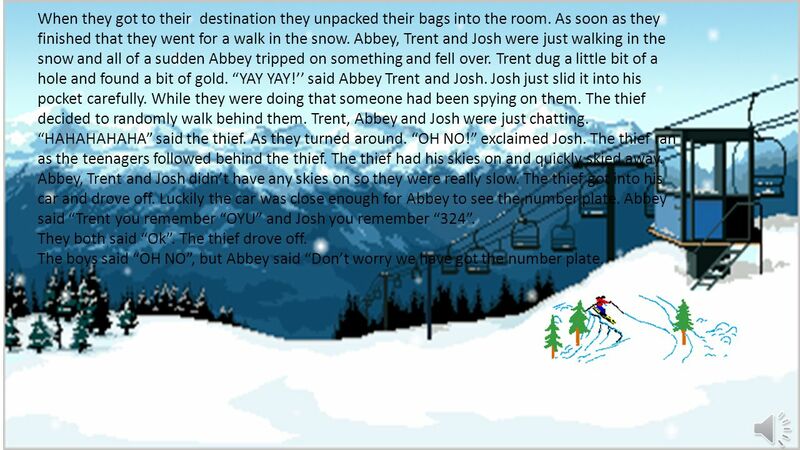 Abbey, Trent and Josh were just walking in the snow and all of a sudden Abbey tripped on something and fell over. Trent dug a little bit of a hole and found a bit of gold. “YAY YAY!’’ said Abbey Trent and Josh. Josh just slid it into his pocket carefully. While they were doing that someone had been spying on them. The thief decided to randomly walk behind them. Trent, Abbey and Josh were just chatting. “HAHAHAHAHA” said the thief. As they turned around. “OH NO!” exclaimed Josh. The thief ran as the teenagers followed behind the thief. The thief had his skies on and quickly skied away. Abbey, Trent and Josh didn’t have any skies on so they were really slow. The thief got into his car and drove off. Luckily the car was close enough for Abbey to see the number plate. Abbey said “Trent you remember “OYU” and Josh you remember “324”. They both said “Ok”. The thief drove off. The boys said “OH NO”, but Abbey said “Don’t worry we have got the number plate. 7 Abbey rang the policeman and told all about the thief and the numberplate. 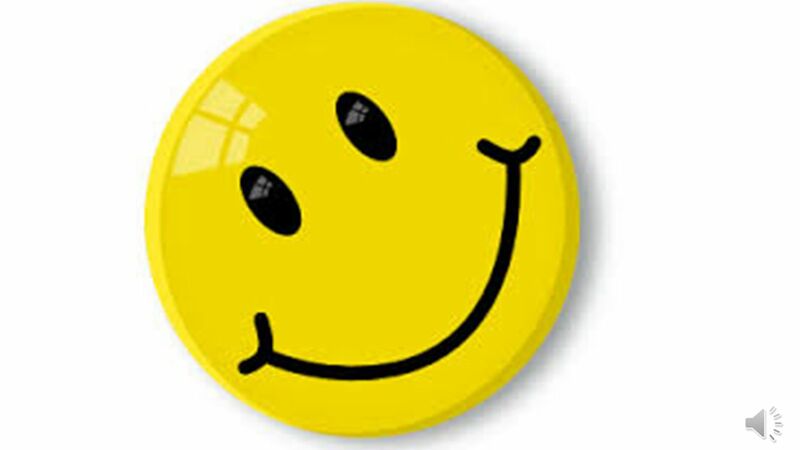 The policeman said that he would try to find it with the help of a few other people but it might not be for a couple of days. Abbey said that that would be ok. The next day the police started looking. Abbey, Trent and Josh went back to the destination. 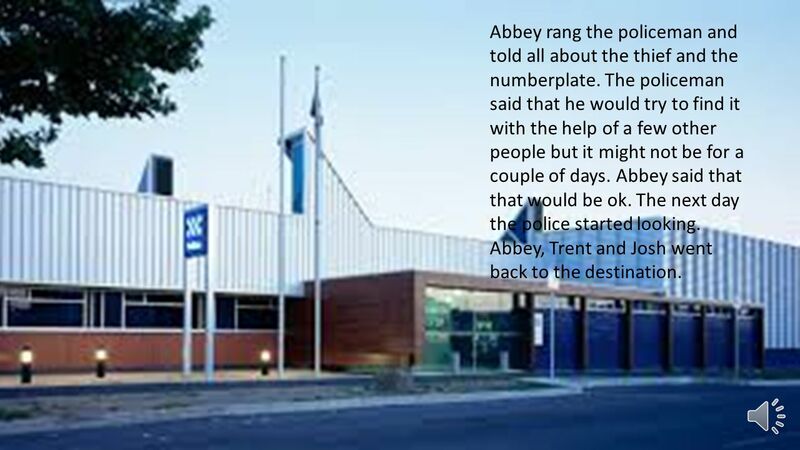 8 A couple of days passed and the policeman rang Abbey. Abbey felt so excited when she saw it said 000 on her phone. She answered it. The police said that they had found it. Abbey screamed she was so excited, she couldn’t stop thanking him. 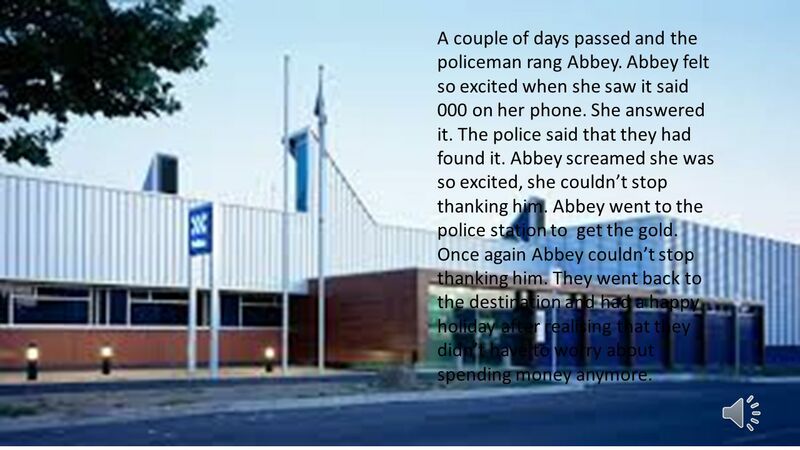 Abbey went to the police station to get the gold. Once again Abbey couldn’t stop thanking him. They went back to the destination and had a happy holiday after realising that they didn’t have to worry about spending money anymore. 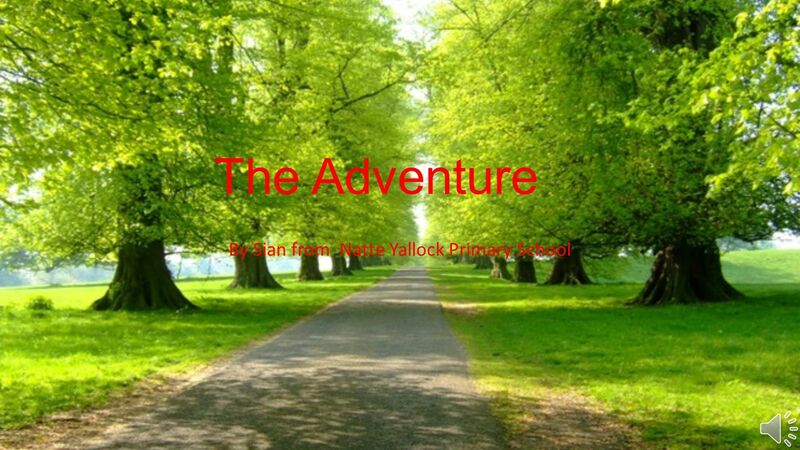 Download ppt "The Adventure By Sian from Natte Yallock Primary School." Angry Arthur Little Pathways Series, Churches Peace Education Programme Written by Elaine Hall Illustrations by Joan McCabe. A Multiplication E-Book Created by Mrs. Miller Marty Mouse Math SOL 3.9. DARBY By Lily Tripp Darby It was 1926, and I was sitting in my daddy’s cotton fields in Marlboro County waiting for my friend Evette to come and play. Piper the Pig Has a Day Out By: Heather Branson. Piper the pig was a very curious pig. He was always snooping around and getting into trouble. One day. Inanimate Alice. My name Is Alice I'm 17 years old. The Overseas Adventure. Once upon a time a girl, named Melissa went on a holiday with her parents to New Zealand. She was very excited about the plane.